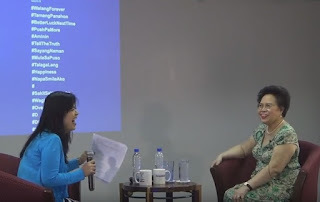 Senator Miriam Defensor Santiago displayed her quick, sparkling wit in a hashtag matching game during the Meet Inquirer Multimedia Forum on Tuesday, May 3. News writer Chito de la Vega asked Senator Miriam to simply match the words he will say with several hashtags displayed on a screen. With every hashtag that Senator Miriam matches, the moderator Arlyn de la Cruz couldn't help but laugh and applaud. Same goes with the audience, who guffawed and clapped exuberantly with the presidential candidate's answers. Everyone was impressed and delighted with how she played the game. Senator Miriam looked very healthy during the forum, very much unlike the way she looked during the final Presidential Debate. She gave her answers lightning fast, displaying unparalleled eloquence for which she is best known for. During the forum, the feisty Senator Miriam once again proved that she is a class by herself when it comes to witticisms. The cancer has not dimmed her brilliance, it has only sharpened her resolve to serve the Filipino people with all that she's got in her arsenal.